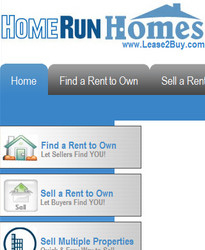 Ronkonkoma, New York, March 1, 2011 - HomeRun Homes (www.Lease2Buy.com), the Rent to Own Homes classified ads website, has contractually agreed to donate blocks of ad space to the Wounded Warrior Homes Non-Profit Organization (www.woundedwarriorhomes.org). Robert Eisenstein, the CEO & Founder of HomeRun Homes, says, "I still have family serving in the Armed forces, so this charity just feels so right!". (1888PressRelease) March 01, 2011 - Ronkonkoma, New York - HomeRun Homes (www.Lease2Buy.com), the Rent to Own Homes classified ads website, has contractually agreed to donate blocks of ad space to the Wounded Warrior Homes Non-Profit Organization (www.woundedwarriorhomes.org).